The WGSW-48040HP is PLANET’s first one 48-port Layer 2 Plus 802.3at PoE Managed Gigabit Switch, which provides high density performance and supports IPv4 and IPv6 Layer 3 static routing. The WGSW-48040HP has 48 IEEE 802.3at PoE+ ports and PoE budget up to 600 watts for catering to medium to large scale of VoIP or IP Surveillance networks at a lower total cost. The WGSW-48040HP can work with PLANET’s POE-E201 extender for reaching up to 200M, 300M or longer distance. Meanwhile, with its 96Gbps high performance switch architecture and 600-watt PoE power budget, the WGSW-48040HP can power up 36 or more PoE IP cameras, through which the recorded video files could be managed by 8/16/32-channel NVR systems or surveillance software for performing comprehensive security monitoring. In the past, customers might need to purchase two or more switches to build the VoIP or IP surveillance network. From now on, customers only need one WGSW-48040HP to achieve the goal; this would be cost-effective, save time and human resource. Faced with the increasingly large number of IP cameras and Wireless APs installed and deployed in all kinds of applications, more and more network facilities start to support the IPv6 protocol for the next-generation networking. By supporting both the IPv4 and IPv6 and plenty of management functions with easy and friendly management interfaces, the WGSW-48040HP is the best choice for IP surveillance and wireless service providers to connect with the IPv6 network. To fulfill the needs of higher power required PoE network applications with Gigabit speed transmission, the WGSW-48040HP features high-performance Gigabit IEEE 802.3af PoE (up to 15.4 watts) and IEEE 802.3at PoE+ (up to 30 watts) on all ports. It perfectly meets the power requirement of PoE VoIP phone and all kinds of PoE IP camera such as IR, PTZ, speed dome cameras or even box type IP cameras with built-in fan and heater for high power consumption. The WGSW-48040HP’s PoE capabilities also help to reduce deployment costs for network devices as a result of freeing from restrictions of power outlet locations. Power and data switching are integrated into one unit, delivered over a single cable and managed centrally. It thus eliminates cost for additional AC wiring and reduces installation time. The WGSW-48040HP can be configured to monitor connected PD (Powered Device) status in real-time via ping action. Once the PD stops working and it is without response, the WGSW-48040HP will resume the PoE port power and bring the PD back to work. It will greatly enhance the network reliability through the PoE port resetting the PD’s power source and reduce administrator management burden. The WGSW-48040HP allows each of the connected PoE IP cameras to reboot in a specific time each week. Therefore, it will reduce the chance of IP camera crash resulting from buffer overflow. Though most NVR or camera management software offers SMTP email alert function, the WGSW-48040HP further provides event alert function to help to diagnose the abnormal device owing to whether or not there is a break of the network connection, loss of PoE power or the rebooting response by PD Alive Check process. Besides being used for IP Surveillance, the WGSW-48040HP is certainly applicable to construct any PoE network including VoIP and wireless LAN. Under the trend of energy saving worldwide and contributing to the environmental protection on the Earth, the WGSW-48040HP can effectively control the power supply besides its capability of giving high watts power. The “PoE schedule” function helps you to enable or disable PoE power feeding for each PoE port during specified time intervals and it is a powerful function to help SMB or Enterprise save power and money. The WGSW-48040HP can be programmed for advanced switch management functions such as dynamic Port link aggregation, Q-in-Q VLAN, private VLAN, Multiple Spanning Tree protocol (MSTP), Layer 2 to Layer 4 QoS, bandwidth control and IGMP/MLD Snooping. The WGSW-48040HP also provides 802.1Q Tagged VLAN, and the VLAN groups allowed will be maximally up to 255. Via the aggregation of supporting ports, the WGSW-48040HP allows the operation of a high-speed trunk combining multiple ports and supports fail-over as well. To help customers stay on top of their businesses, the WGSW-48040HP switch not only provides ultra high transmission performance and excellent layer 2 technologies, but also offers IPv4/IPv6 VLAN routing feature which allows to cross over different VLANs and different IP addresses for the purpose of having a highly secured, flexible management and simpler networking application. The WGSW-48040HP offers a comprehensive Layer 2 to Layer 4 Access Control List (ACL) for enforcing security to the edge. It can be used to restrict network access by denying packets based on source and destination IP address, TCP/UDP ports or defined typical network applications. Its protection mechanism also comprises of 802.1x Port-based and MAC-based user and device authentication. With the private VLAN function, communication between edge ports can be prevented to ensure user privacy. Furthermore, the WGSW-48040HP provides DHCP Snooping, IP Source Guard and Dynamic ARP Inspection functions to prevent IP snooping from attack and discard ARP packets with invalid MAC address. The network administrators can now construct highly secured corporate networks with considerably less time and effort than before. 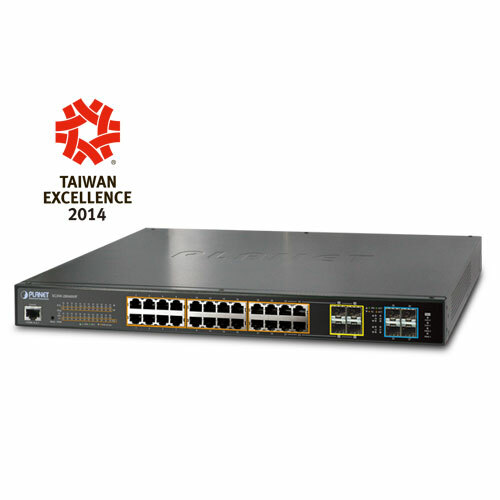 The WGSW-48040HP Managed Switch is equipped with console, WEB and SNMP management interfaces. With the built-in Web-based management interface, the WGSW-48040HP offers an easy-to-use, platform-independent management and configuration facility. The WGSW-48040HP supports standard Simple Network Management Protocol (SNMP) and can be managed via any management software that supports SNMP protocol. For text-based management, the WGSW-48040HP can be accessed via Telnet and the console port. Moreover, the WGSW-48040HP offers secure remote management by supporting SSH, SSL and SNMPv3 connection which encrypt the packet content at each session. The WGSW-48040HP provides 4 extra Gigabit TP/SFP combo interfaces supporting 10/100/1000Base-T RJ-45 copper to connect with surveillance network devices such as NVR, Video Streaming Server or NAS to facilitate surveillance management. Or through these dual-speed fiber SFP slots, it can also connect with the 100Base-FX / 1000Base-SX/LX SFP (Small Form-factor Pluggable) fiber transceiver to backbone switch and monitoring center in long distance. The distance can be extended from 550 meters to 2 kilometers (multi-mode fiber) and up to above 10/20/30/40/50/70/120 kilometers (single-mode fiber or WDM fiber). They are well suited for applications within the enterprise data centers and distributions. Providing up to 48 PoE+, in-line power interfaces and 4 Gigabit TP/SFP combo interfaces, the WGSW-48040HP can easily build a power centrally controlled IP camera system for the enterprises. It can work with 8/16/32-channel NVR and surveillance software to perform comprehensive security monitoring. For instance, one WGSW-48040HP can combine with one 32-channel NVR and one 8-channel NVRs; that is, each of its PoE ports can link to a specific PoE IP camera for the administrators centrally and efficiently manage the surveillance system in one site. The 4 Gigabit TP/SFP combo interfaces in the WGSW-48040HP also provide flexible Gigabit TP or fiber connection for uplink to public server groups. The WGSW-48040HP 48-port Gigabit IEEE 802.3at High Power PoE Web Management switch features both IEEE 802.3af and High Power IEEE 802.3at Power over Ethernet (PoE) that combines up to 30-watt power output per port, and PoE budget is up to 600 watts which can deploy up to 48 PoE devices. With the built-in robust IPv4 / IPv6 Layer 3 traffic routing protocols, the WGSW-48040HP ensures reliable routing between VLANs and network segments. The routing protocols can be applied by VLAN interface with up to 128 routing entries. The WGSW-48040HP is certainly a cost-effective and ideal solution for enterprises. 2014-02-27 1.0 Initial release for User’s manual. 2014-02-27 1.0 Initial release for Command Guide.